← Chinese Laundries in Charleston, S. C.
When Chinese laundries change owners, the typical situation involves new or younger Chinese buying the business of a retiring Chinese laundryman. 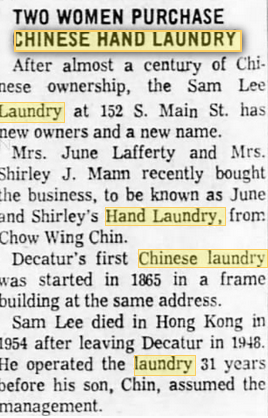 In 1962, however, the Decatur, Illinois newspaper reported that Mrs. June Lafferty and Mrs. Shirley J. Mann, who don’t seem to be Chinese, bought the Sam Lee Laundry that allegedly dated back to 1865 at 152 S. Main Street and renamed it, June and Shirley’s Hand Laundry. However, according to a 1903 newspaper article, there were no Chinese listed in the first City Directory of 1871, with the first listing of a Chinese laundry occurring in 1883-4 for Joe Hop Hing who had a laundry at 152 S. Main Street. Note that this is the same address of the Sam Lee Laundry the two women bought in 1962. However, in 1883-4, the City Directory shows that Sam Lee Laundry was at 145 E. Prairie Street and a few years later at 149 E. Eldorado St.
Another inconsistency in the information is that the 1900 census records indicated that Joe Hop Hing did not immigrate to the U. S. until 1890, so if that is correct, he could not have operated a laundry in Decatur as early as 1883. 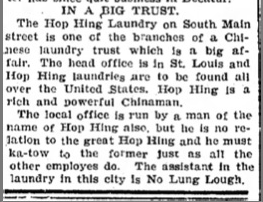 The Hop Hing Joe laundry was reportedly part of a “trust” or part of a set of laundries in different cities that was operated by Chinese who had some financial and or family ties. This trust was alleged to be run by Hop Hing, and headquartered in St. Louis, but I could not verify this claim. 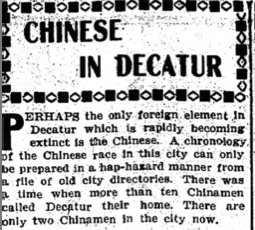 Historian Huping Ling, author of Chinese St. Louis does mention a Chinese named Hop Hing in connection with his arrest in 1914 for manufacturing opium, and again in 1915. It does not seem likely that he is the head of the trust mentioned in the Decatur newspaper.